I’ve been wondering why I’m not compelled to post so much lately, and I think what it boils down to is that, while life continues to be busy, I think we’ve settled down to a pretty normal-feeling, day to day existence. Which is good. I don’t want to feel like a tourist for an entire year, and everything can’t possibly feel like a magical voyage of discovery all the time, but on the other hand, I don’t want to feel like I’m squandering the opportunity I’m lucky enough to have. Most of all, I miss work. I loved being a homemaker (stay at home mum, whatever you prefer) when I had small children to take care of. It’s less fun now. I like having a purpose other than running my house. And I feel like a bit of a heel for complaining, because who wouldn’t want to have a year off in an exciting new city?? It’s not all bad. It’s not even very bad at all, and it’s not like I spend my whole day reading Facebook and eating bonbons. Well, not the *whole* day. I’m deep into a bread-baking kick, so I’m much more likely to be munching on sourdough potato-rosemary bread than bonbons anyway. Speaking of sourdough, I can’t believe how easy it was to make some. And the bread is delicious, though it takes a good 36 hours to make a batch. I’ve even started converting yeast recipes to use my sourdough, to mostly good success, though I do resort to yeast bread when I don’t plan ahead. It’s great! I love the result and the process. And I’m going through those little 1.5 kg bags of flour like there’s no tomorrow. I have to start buying larger quantities at a time. Or, possibly, just eat less bread, already. I applied to volunteer with the Greenwich museums. My ‘induction’ is tomorrow (The word induction in this context makes me laugh. It reminds me of childbirth. I’m assuming there will be less pain. ), and I’m ridiculously excited, even though I know it will basically be pointing people to the loo and telling the kids to please not touch the displays. Also, they made a big deal out of the fact that I have to be able to help out during an evacuation. And the exploring has yielded some nice discoveries. I’ve been doing a lot of walking. I actually literally walked through my shoes and had to buy another pair. I discovered the Thames Path, which is a national trail that goes the whole length of the south bank of the Thames, from the Thames barrier pretty much directly north of my house, to the Cotswolds, where the Thames’ source is. In London, it’s 64 km long, and I’ve done about 20 so far, in two excursions. The first time, I just started walking after dropping the kids off at school, and stopped in Greenwich about 10 km later (though it’s only about 3 km as the crow flies. It’s a fairly winding path, being a river and all) and took the bus home. The second time, I took the bus to where I left off, and continued from there. For a big, developed city, there are plenty of beautiful places, and I love the juxtaposition of greenness and dense buildings. 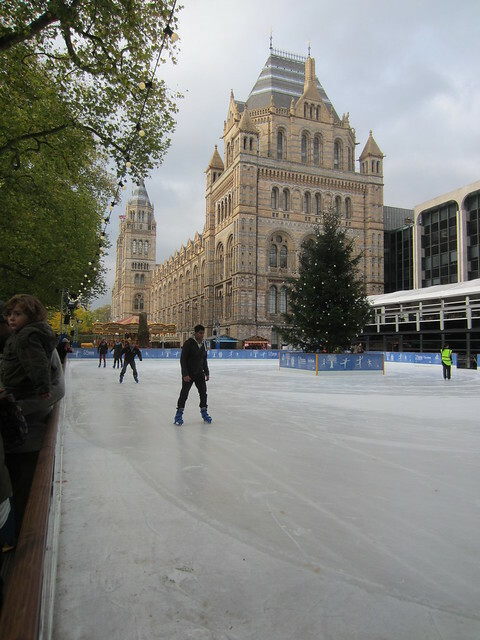 I’d like to walk the length of the portion of it that is in London – I plan on going again on Friday. Greenwich Ecological Park, next to the Greenwich Milennium Village. Guy (you can just see his yellow reflective vest through the branches) sitting on his very fancy chair. 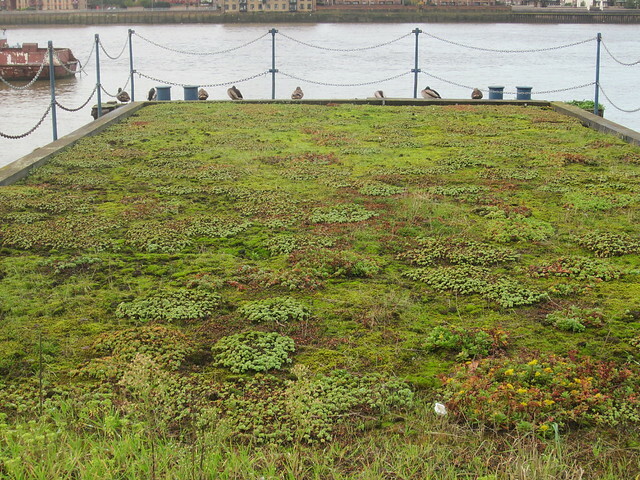 Now-disused dock, planted with mosses and grasses to encourage the ducks to come hang out. 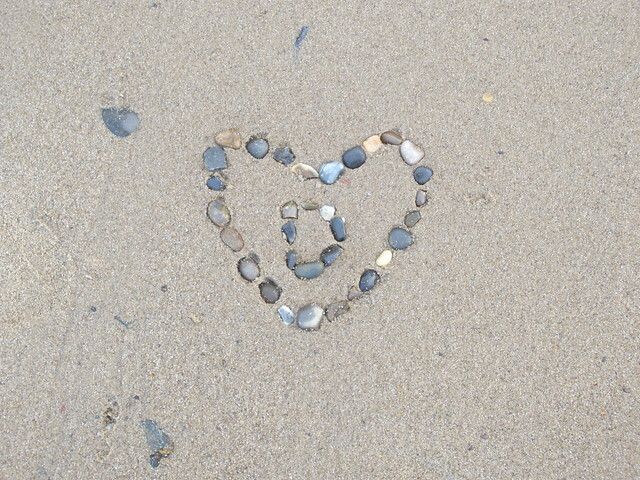 Message left by somebody (not me) on the beach in front of the Royal Naval College in Greenwich. Entrance to Blackheath Foot Tunnel (you can see where it comes out on the other side). 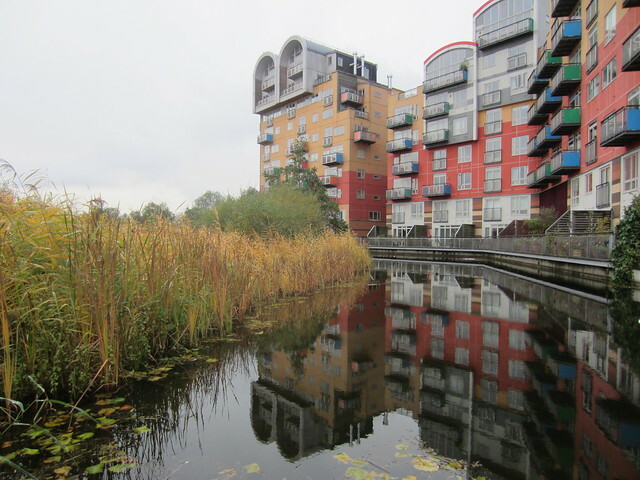 Near the Canada Water tube station. There’s a hideous mall just to the left of this. 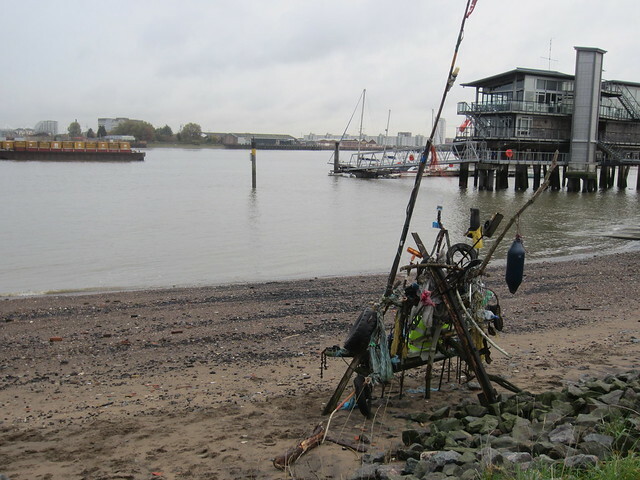 There are some less nice views too, especially closer to the Thames Barrier, which is a very industrial area. 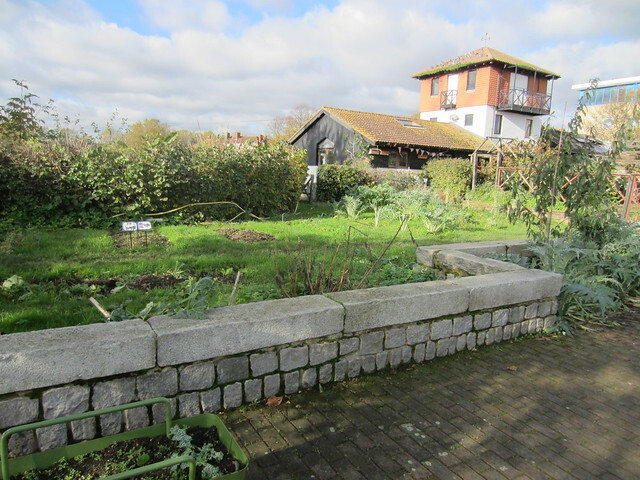 A good chunk of the land near the path is under redevelopment. 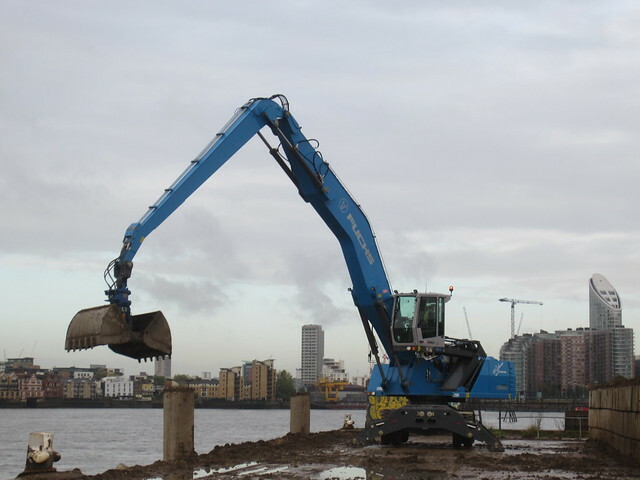 You can walk right through the construction site in one place, and I was shocked to see a digger moving stuff from the site into the river, blocking the path. There was a sign saying I needed to wait for a signal from the crane operator before passing by. And that whole section of the trail was right next to a two-storey drop into the river, with no barriers or anything. That kind of stuff would never fly in Canada. Can you imagine the potential lawsuits? That’s the digger I walked past. 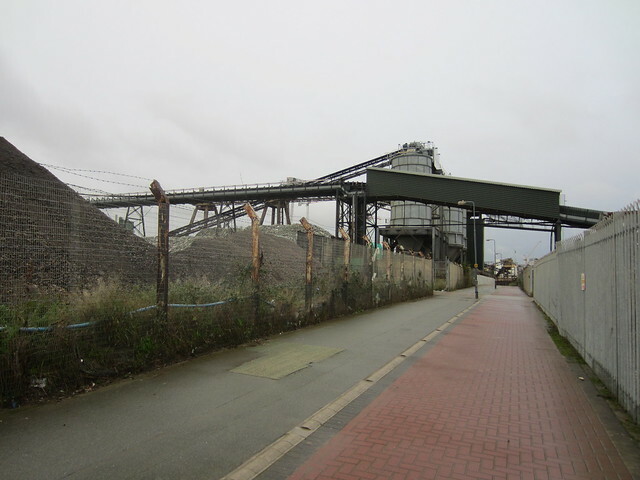 Very picturesque quarry near the Thames Barrier. 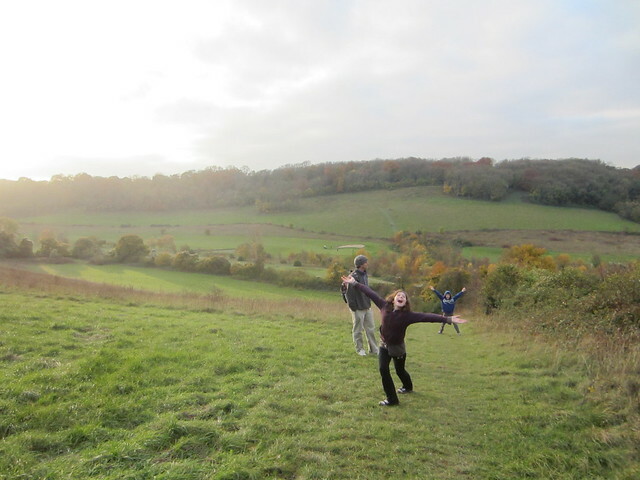 We all went on another country walk a couple of weeks ago. This one was in Kent – Otford, to be precise – which is a little closer. It’s amazing to me that it only takes a 35 minute train ride out of a city of 8 000 000 to reach open countryside. Sheep lawn mowers. For real. 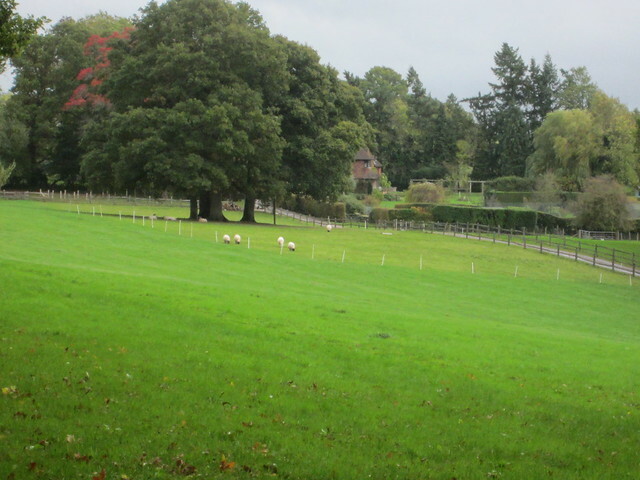 There was a sign saying to please keep the gates fastened behind us so that the sheep, which were brought in to maintain the grassland, don’t wander off. This walk was shorter, and muddier, but with a better pub. We’re about to enter into the usual December Madness. Though, for once, it’s not my December that’s the maddest. Zebula auditioned for a part in the chorus of a local Youth Theatre’s musical production of Treasure Island and got in, so she’s got 8 performances to look forward to in December (plus dress rehearsal). She’s absolutely loving it! With the choir, I have a concert, for which I sing a short solo (gulp! ), on December 8th, and we’ll do some caroling later. And my neighbourhood singing group is caroling on another day. Surprisingly, there are no conflicts with any of that, even though Dr. Thingo will be in Waterloo for a week in December! I hope your own December madness isn’t too mad! 120! Huh. Almost four months since we left. Winter is starting to set in. Which means it’s wet and chilly. I don’t think it’s gone down below 3 degrees yet. The days are growing alarmingly short (according to weather websites for both Waterloo and London, we got almost an hour less of daylight today than Waterloo will have, and it’s not even December yet!). So, I finally sorted through the pictures I’ve taken for the past three weeks, including our mini-trip to Liverpool/Manchester at the end of October (30th and 31st). It seems anticlimactic to talk about it after this long. It was a nice trip. Quick, though. We barely scratched the surface of either city. In the end, Liverpool wins because of the waterfront, but Manchester seems like a cooler city to live in. We did not go see any football. Anyway, it was nice to get away and see a new part of England. Two of Liverpool’s Three Graces. 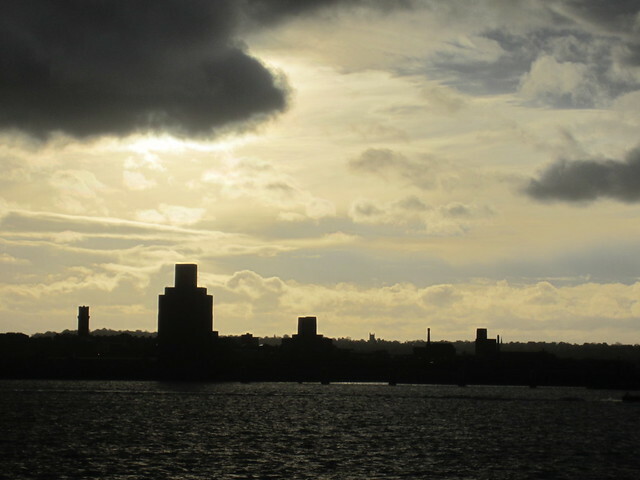 The Liver Building on the left, and the Cunard Building on the right. 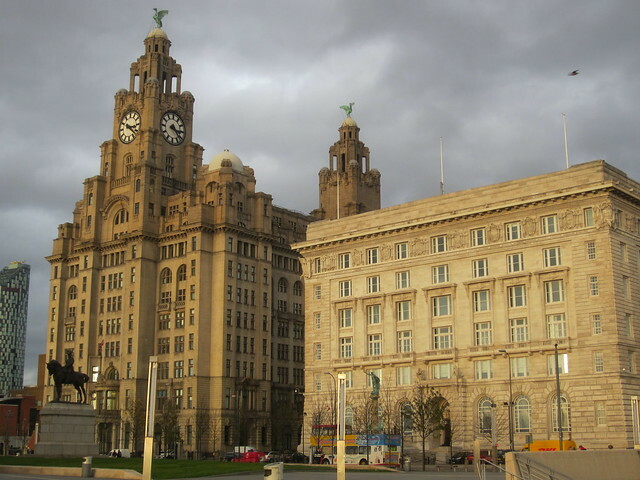 Liverpool is a medium-sized city, with a long maritime history, owing to its geographical location. It’s busy and vibrant, and seems to have had a fairly recent redevelopment to encourage tourism and new residents. They also seem to be capitalising on the fame of a certain musical quartet from the sixties. Oh, and I had an excellent espresso at a place whose name I can’t remember. Dr. Thingo will tell you. Manchester is a much bigger city, but, surprisingly, with a cosier feel. We ended up walking around looking for libraries. It sounds crazy, but they have some beautiful buildings here. 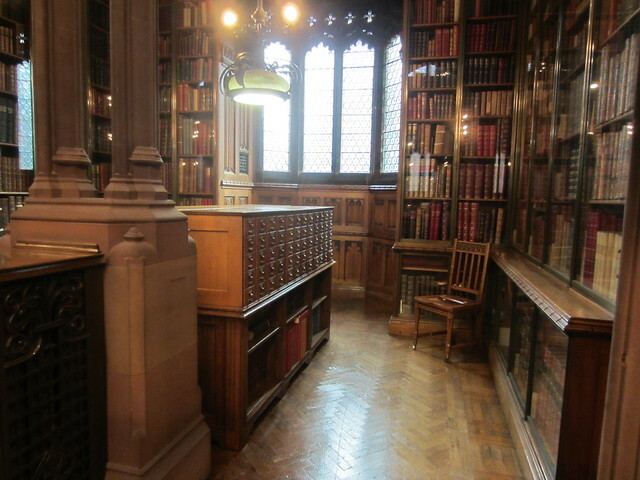 A nook in the Reading Room at John Rylands Library, University of Manchester. There were similar nooks with desks instead of card catalogs, but there were people working at all of them, and I didn’t want to disturb. But doesn’t this look nice? I’d work there! 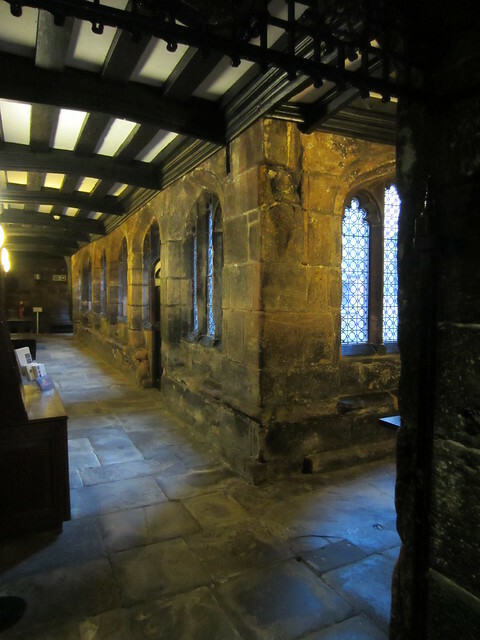 We also sought out the library at the Chetham School of Music. It is the English-speaking world’s oldest public library, founded in 1653, but the buildings that houses it and the music school were built in the 15th century, as a monk’s college. It’s a drafty old building, full of dark hallways, and big halls, with large fireplaces no longer in use. Now it’s a boarding school for music students (I think the lovely lady who showed us around said they said they take the kids as young as 8. 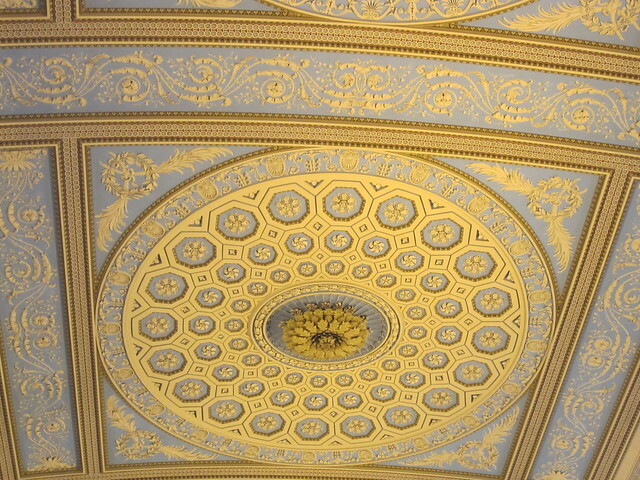 We visited the public areas, where the library is and where they hold recitals. 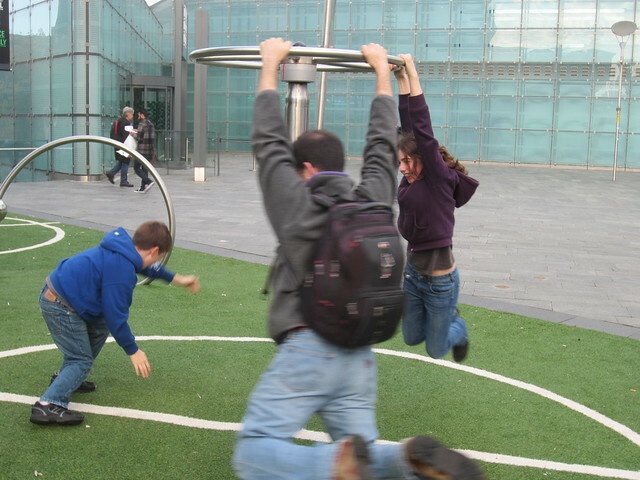 The kids live in more modern buildings adjacent to these ones.). 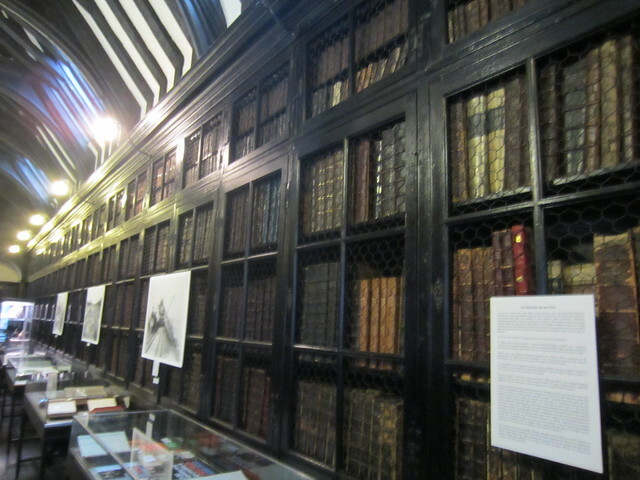 There it is – one of the original libraries. 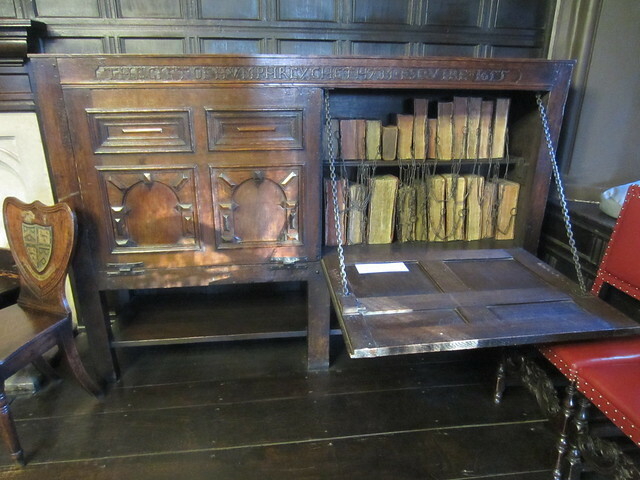 The books are chained to the unit. Scholars were encouraged to come and consult the collection of books and were asked for nothing in return. 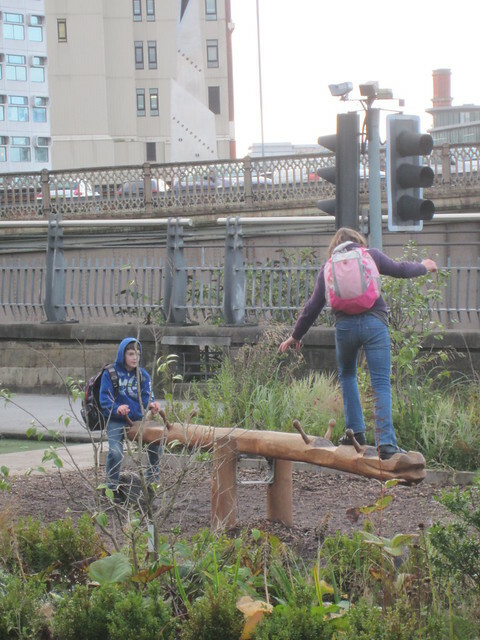 We walked around, to see Manchester Cathedral, which had a cool garden area outside, in a spot that had clearly once been a road (the traffic signals are still there). There’s some construction happening around the cathedral, which is why the roadway is blocked off, so I’m not sure if the garden is permanent or not, but I thought it was a cool idea, even if it is temporary. Yes, I tried it out too. Other highlights included bananalambs, conveyor-belt sushi (Why do I like this better than all-you-can-eat sushi? I do! ), a fantastic yarn store, and Europe’s first Chinatown. Next up, lots of walking. Last weekend, we went to see the Lord Mayor’s Show, which was your typically British, weird but endearing, combination of tradition and ceremony and a good show. And I didn’t bring my camera, so you’ll have to see the website for photos of the event. The Lord Mayor of the City of London, Fiona Woolf this year, made the trek from the Mansion House to Westminster to swear an oath to the Crown. There were horses, and fancy carriages, and hats, and robes and marching bands and floats and a giant inflatable pig. And there’s apparently a Livery of Information Technologists. And they had robes. Why don’t I have robes?? But I was confused, because I thought the mayor of London was that guy with the unfortunate haircut, Boris Johnson. And it is. Why two mayors? So I looked it up. And in doing so, I found some videos, by CGP Grey, which are hugely entertaining and informative (And then I fell down the rabbit hole of his YouTube channel and lost a lot of time but learned a lot of stuff. Check out the one about the Canada/US border – it’s great!) I like this guy – he talks at my speed. Anyway, here for your edification, is the reason why London has two mayors, and why there’s a yearly ceremony with a gilt carriage and a funny hat. Enjoy! Well, it looks as though I have failed in my mission. So, as an interlude, I give you this educational post, which I started a while back, after a research trip to my local library. I know, exciting, right?! If it helps, you can imagine that it’s narrated in the voice of David Attenborough. Pictures are chosen from shots I’ve taken since we got here. 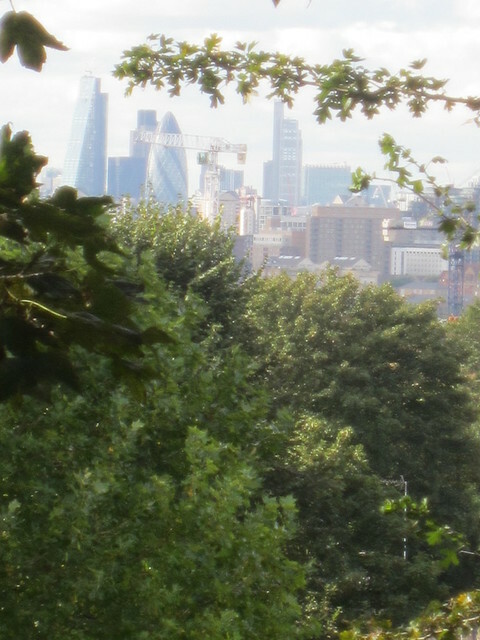 I’m exploring my immediate neighbourhood more, and I decided to do a little research on our area of London. 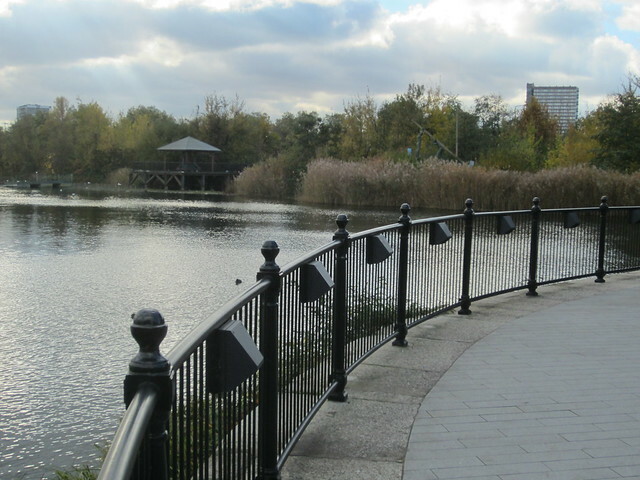 We live in the district of Charlton (postal region SE7), which is part of the Borough of Royal Greenwich, one of London’s 33 boroughs. 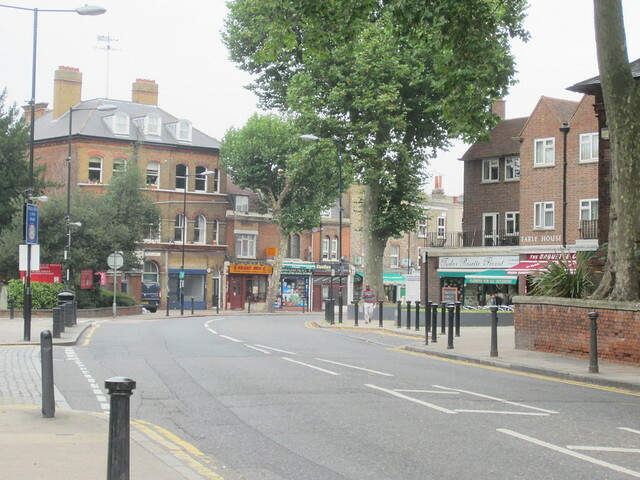 I couldn’t get population numbers for Charlton proper, but Royal Greenwich has a population of about 260 000, and a density of about 5 400 people per square kilometre. For comparison, in places I’ve lived, Toronto has a density of about 4 100 people per square km, Waterloo (Ontario) has about 1 500, Seattle has about 2 900, and Ottawa has about 1 900 (urban). (Thanks, Wikipedia!) So it’s definitely the most densely populated area I’ve ever lived in. 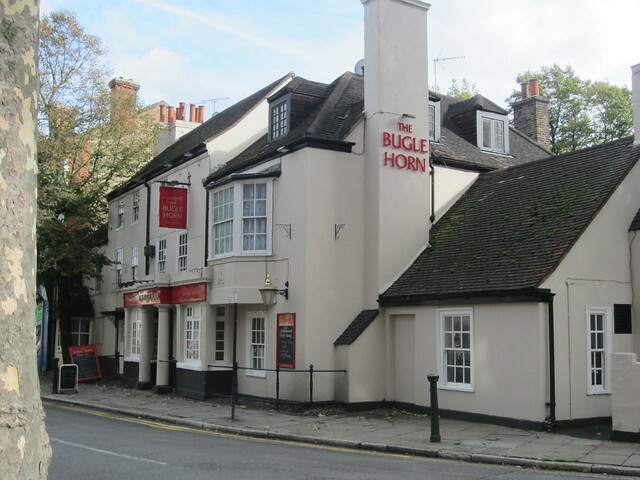 The Bugle Horn, on The Village, built from three glued-together cottages, originally established in the 17th century. Having spent my whole life in either Canada or the US, most of what I’ve experienced that is not a natural phenomenon is fairly new. I’m always amazed that anything that is more than a couple hundred years old is still standing and functional. I’m consequently amazed a lot here – there is some OLD stuff around, everywhere. 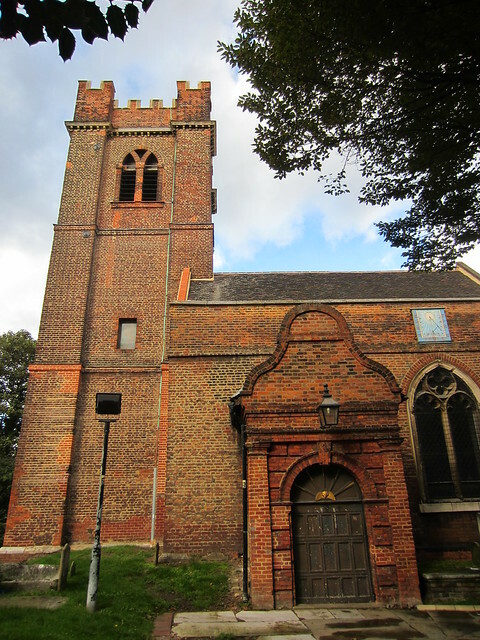 Charlton was a village in the county of Kent until 1855, when it was absorbed into the metropolitan area of London. However, archaeological evidence has shown that there was a settlement here as early as 50 BCE. Obviously, there isn’t too much documented history before the middle ages, but apparently it was called ‘Cerletone’ in the late 11th century, and it was known as ‘Charlton by Woolwich’ for a long time afterwards, to differentiate it from the other Charletons; since the ‘cerletone’ is a derivation of Old English words meaning something like ‘farmstead of the freemen’, it was apparently a common place name. The oldest church in the district is St. Luke’s, built in the mid 17th century. However, there has been a church on that site since the 11th century. 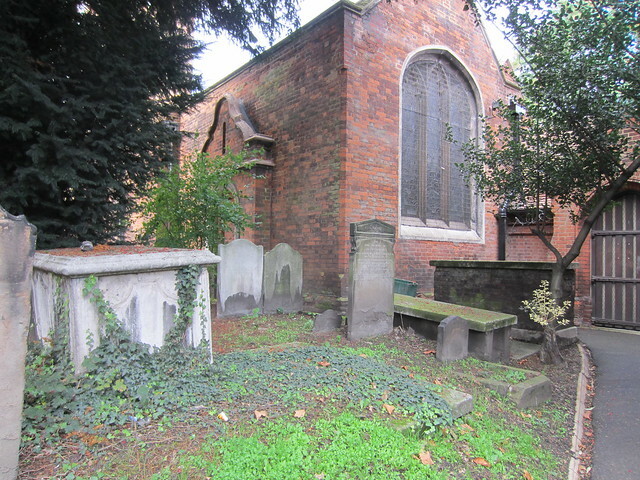 There’s a small graveyard on the church grounds. Most of the tombstones and crypt inscriptions are too worn to be legible. 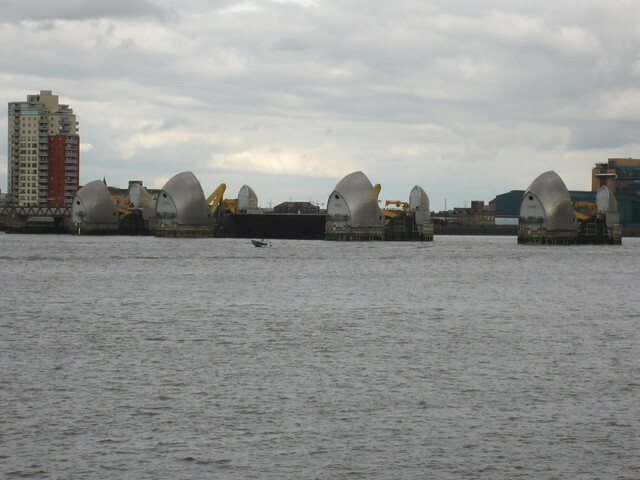 It’s a largely residential area now, with a few landmarks – most notably, the Thames Barrier, by the river (which, technically, isn’t Charlton, but New Charlton…), the Valley (home of the Charlton Athletic Football Club), and Charlton House. Most of the roads are along ‘coombe’ lines, which are valleys. It’s a hilly area, and has a great view of the city on clear days. It’s the Gherkin! And other stuff. 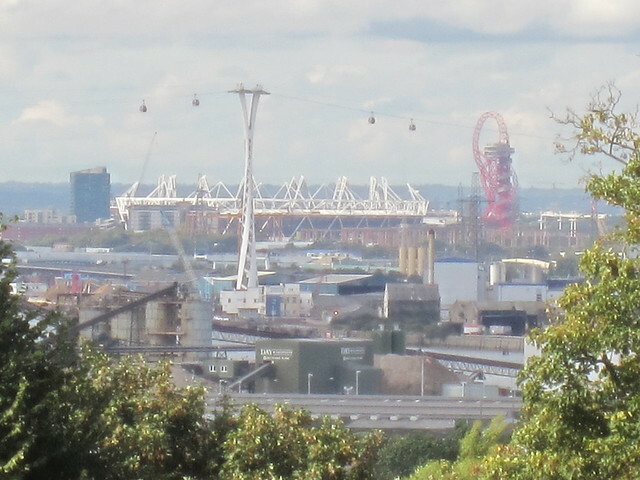 Super-zoom of the 2012 Olympic Stadium and roller-coaster Observation Tower thingy. The centre of the village is the village road (now known just as The Village. 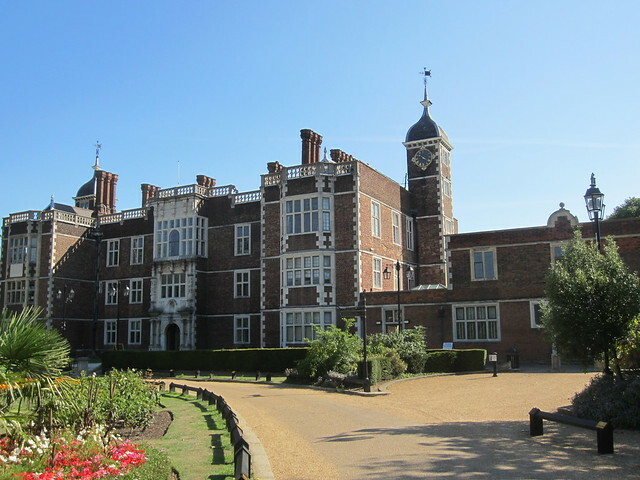 It’s the only The Village in London), and the old manor house, Charlton House, is its principal landmark. The house was built in the early 17th century in the Jacobean (whatever that means) style by Adam Newton, who was tutor to Henry, son of James I. It belonged to the Maryon-Wilson family from the late 1700’s until they sold it to the city in 1929. It was used as a hospital during the First World War. 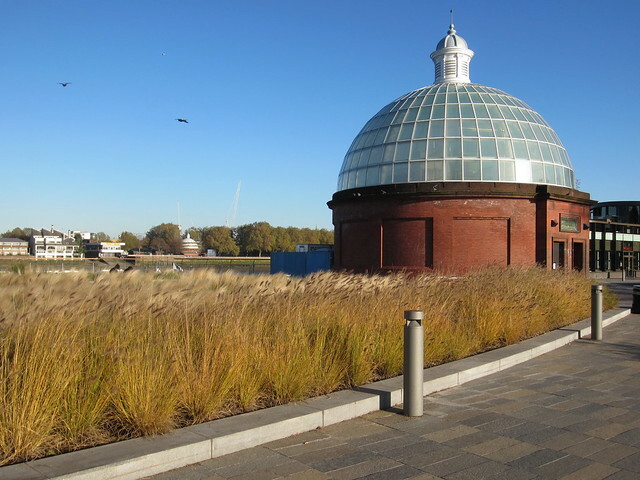 The summer house, a separate building on the north side of the property, which, before the area got built up, apparently had a beautiful view right down to the Thames, became a ‘public convenience’ (code word for ‘toilet’) for a while in the 1930’s. 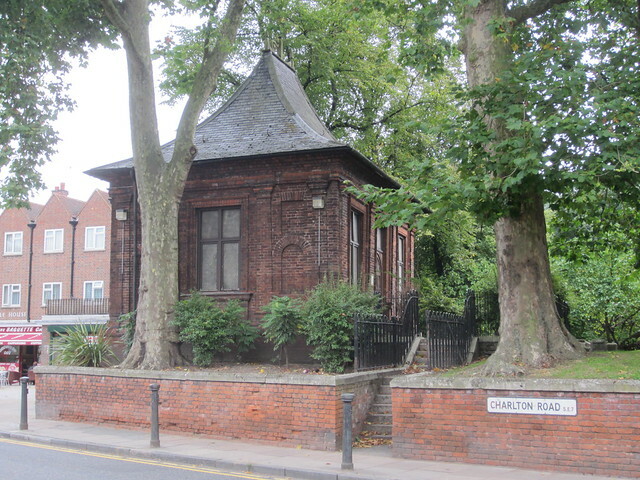 An extension, built in 1877 became a public library after the house was sold to the city (the library later got moved into what had previously been the chapel). Now it’s a community centre, with the Charlton branch of the Greenwich library system, a tea room, and meeting rooms for community events. The lawn in front of the house used to be the Village Green. The grounds behind the house, have become Charlton Park, complete with football pitches, a cricket pitch, a workout area (built by Adidas during the 2012 Olympics) and a little coffee shop. It’s like our own tiny Downton Abbey. 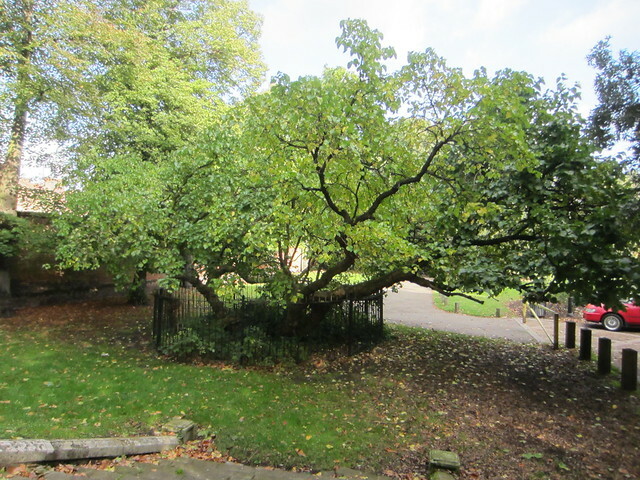 Oh, and Britain’s oldest mulberry tree is here, planted in 1608. 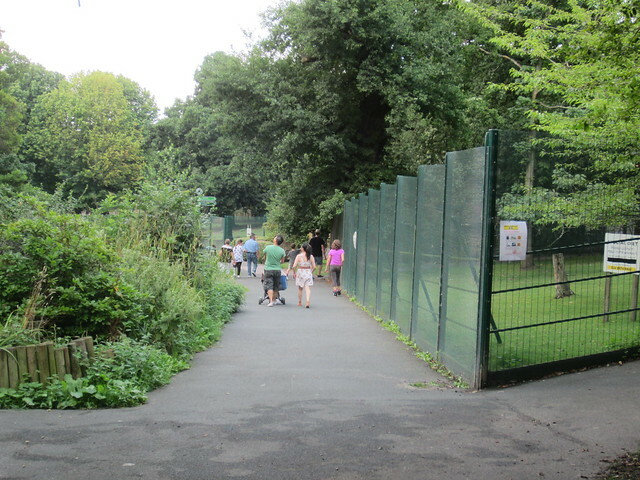 There is still a lot of evidence of the importance of the Maryon-Wilson family in this area – in particular two adjacent parks (Maryon Park, and Maryon-Wilson Park), situated near the sandpits where the original settlements had been. Apparently, the woods there were originally part of what was called Hanging Wood, a known haunt for Highwaymen. The park reminds me of Waterloo Park at home, with its animal enclosures and hilly terrain. It’s quite lovely, and deliberately overgrown with blackberries, planted there to encourage birds and other wildlife to stay. 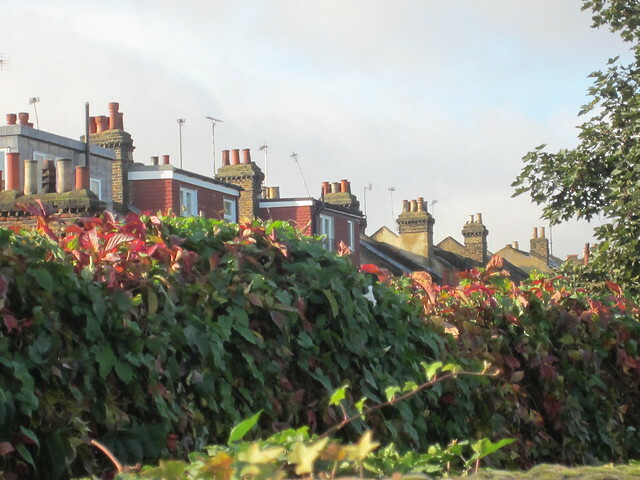 I haven’t been able to ascertain yet what year our street, Elliscombe Road, was developed. I’m guessing, from the rest of the development in the area, that it was in the 1850s. What’s interesting is that it’s apparently named after a guy called “Mad Jack” Ellis, according to one history book I consulted – clearly I need to find out more about this guy! 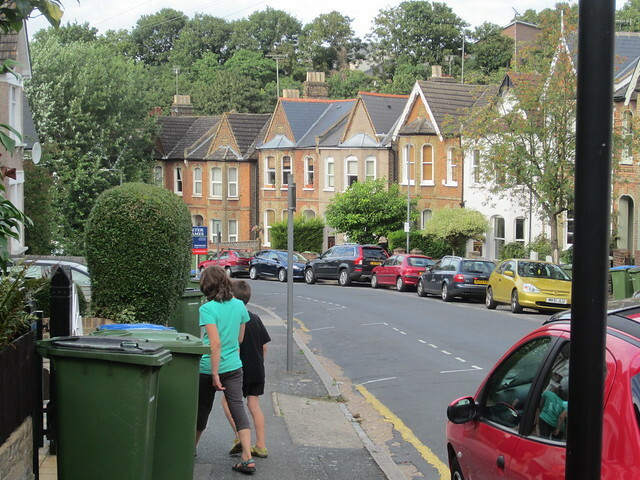 Elliscombe Road – the kids are just turning into our front walk. There’s more – the kids school, the Charlton Athletic Football Club among other things, but I’ll research them later. Full photo set for October is here. Though it is incomplete. My mission for this week is to catch up, both on photos and posts. It’s been a lovely month since I last posted. London is a fun town – always busy. Highlights from the past month include, surprisingly, the British Library (their Treasures room, full of old manuscripts, documents, and musical scores is fascinating! 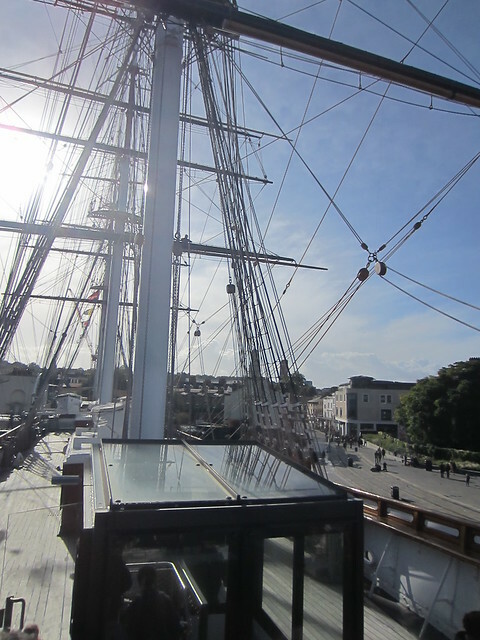 ), and less surprisingly, the Cutty Sark (very well-conceived, and fun). I’ve also enjoyed my solo trips to the Tate and the National Gallery. I have to say that looking at art is a whole lot nicer without having the kids drag me away after 2 whole seconds of looking at a painting. It was the fall half-term break last week. The school year here goes longer (until the end of July), but there are more frequent, longer breaks throughout. The year is divided into three terms, and there are week-long breaks in the middle and the end of each (though the break in December at the end of the first term, just like at home, is two weeks) School is going well for the kids so far. The pacing is different, and they actually assign a fair amount of homework, which is a switch from the way they do things at home. I like it, both because I know what they’re working on, and because it keeps things fresh in their minds. 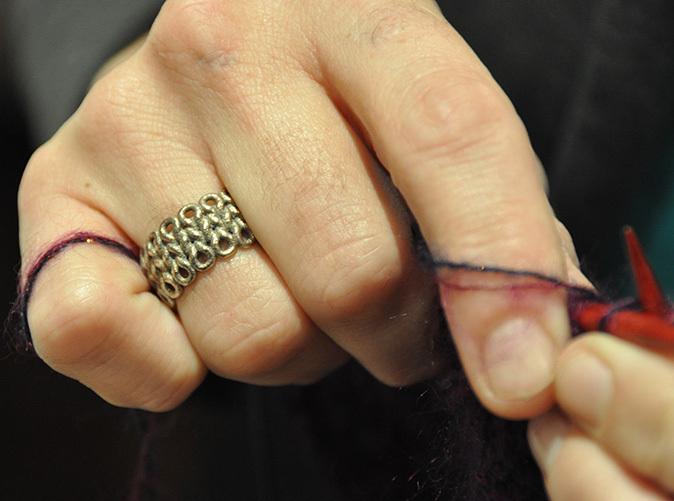 A sweater for my finger! 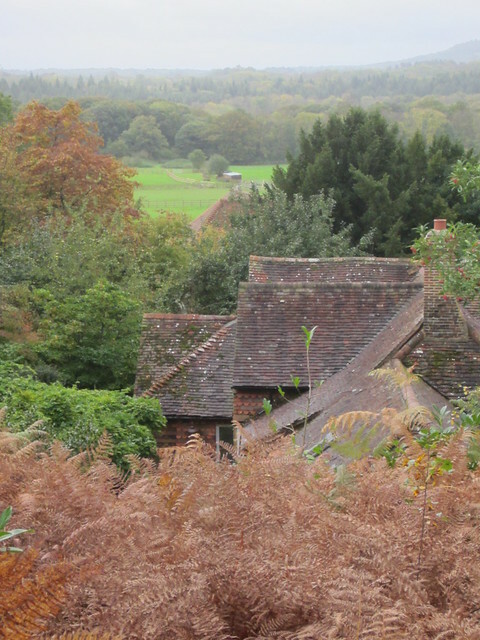 The highlight of the past few weeks for me has been a walk in the Surrey countryside last weekend. Dr. Thingo found out about this book, which we bought, and we decided to try out one of the walks. 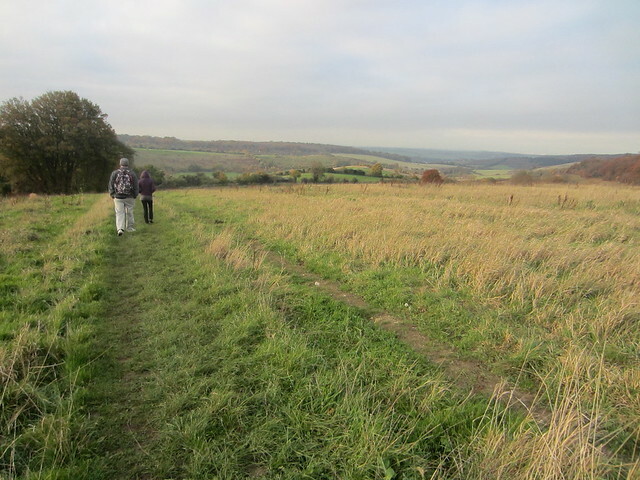 All the walks, as the title says, are close to London, meaning about 1 to 1.5 hours away by train. They encourage you to use the train to get there and back, mostly because the large majority of the walks are from one train station to another, cross-country, and it would be impractical to drive there (though one could drive to the first station, do the walk, and then take the train back to the first station and drive home). The walks in the book we have are all between 12 and 22 km, but apparently the second volume has shorter ones. They’re updated every couple of years, which is important, because the walks take you away from the roads, and into the countryside. It’s important that landmarks be current, especially for people like me with lousy senses of direction. All the walks take into account a stop for lunch in a town or village, and for tea later on, if you feel like it. There’s a walk for every week of the year, plus an extra, and different routes are recommended for different seasons, depending on terrain and views and whatnot. We decided on a shortish (14 km) one in Surrey. 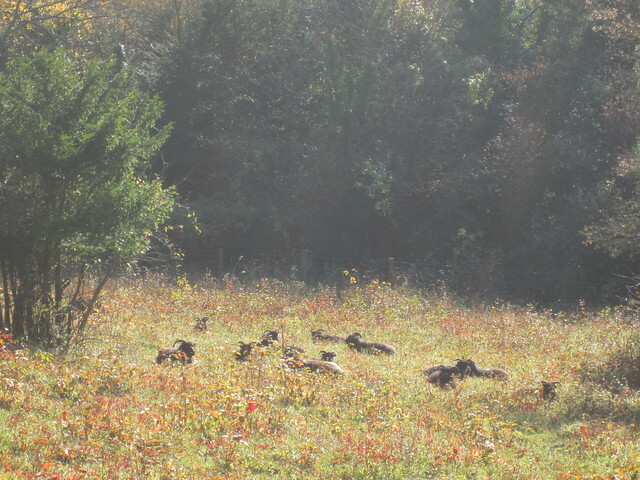 The walk took us through woods and across farmers’ fields. 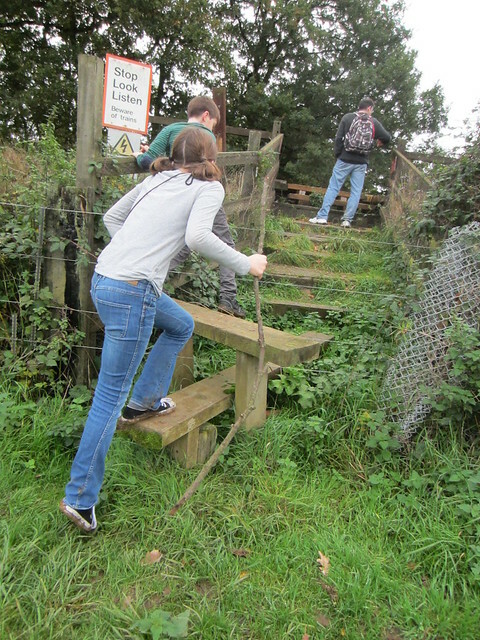 I was surprised that there were so many public paths across what were clearly private farms. 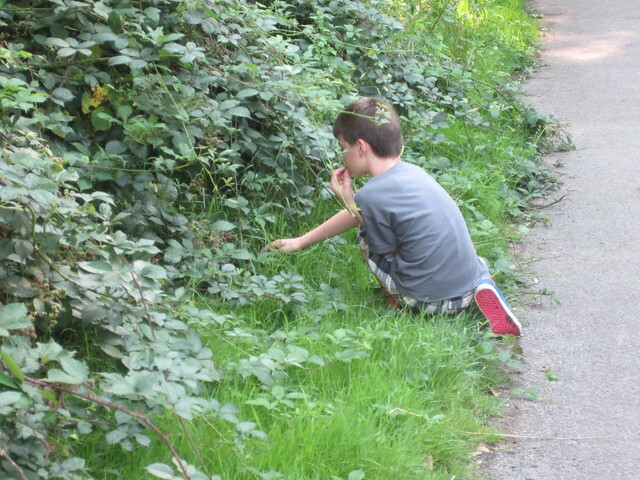 This, I found out later, is because there are rights-of-way that are hundreds of years old. 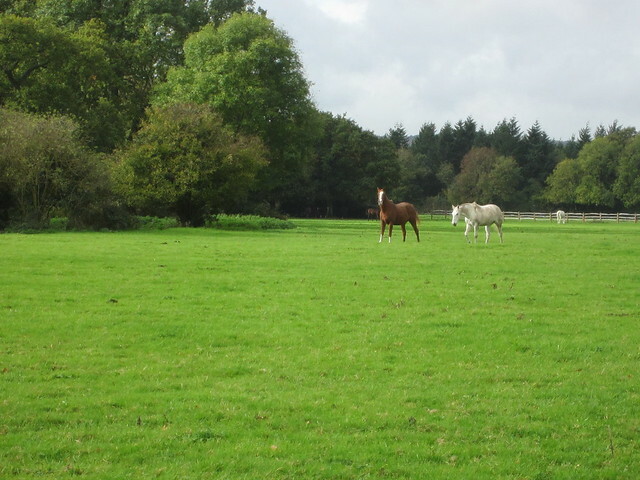 We were walking through fields where sheep, or horses, or cows were grazing. It seemed so foreign to me – I’m pretty sure there’s no way Ontario farmers would let people traipse through their fields in direct contact with their livestock or crops, let alone provide and maintain gates and stiles to permit them to do so. On the other hand, I’ve never lived in the country, so maybe it’s true there too! I should look into it, because it was a great way to spend the day. The word of the day was ‘stile’. These are everywhere, in various states of repair, or just replaced with more substantial gates, or kissing gates. There are fences around all the fields. 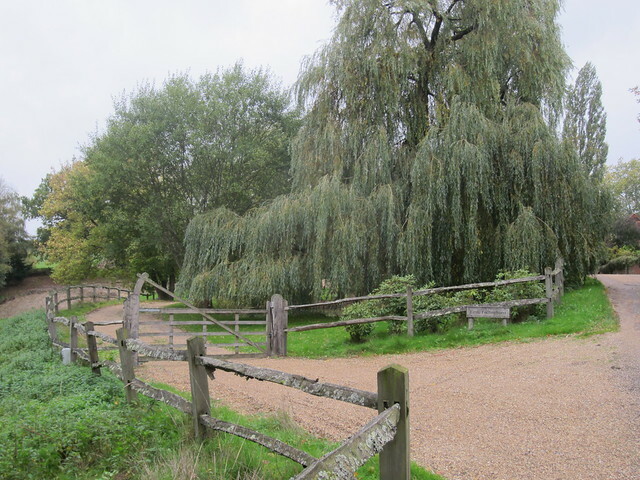 Some have gates, but most have stiles, which are just crossed wooden steps that help you get over the fences but which, presumably, the horses and sheep don’t know what to do with. We stopped for lunch in a village called Chiddingfold about a third of the way through. It rained a little on the second leg of the walk (hey, it’s England in the fall. You get all the weathers in any given day), but on the whole it was absolutely lovely. I was so stoked by it all that I said, while we were having coffee at the end of the trek, that I wanted to do another one the following weekend. The kids weren’t terribly impressed, but aren’t against going sometime later. I was just pleasantly surprised that 14 km went by without any complaining at all! The promise of castles and ocean views for future walks seems to be a good incentive. One of the walks even has a dip in the Channel built in, but I guess we’ll wait until the summer for that one. We took a whirlwind trip to Liverpool and Manchester during the break too, and I’ll talk about that in my next post.